In the picture above you will see the wine village of Leiwen (left). 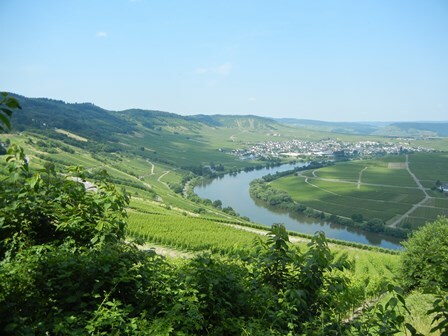 Further around the bend of the river (to the right) is the wine village of Trittenheim. This is basically the view of the Mosel you will get when you drive though the Hunsrueck mountains. 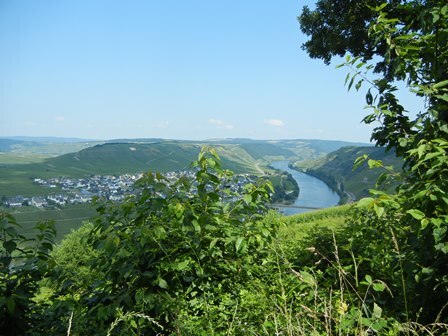 And this was also our first view of the Mosel when we arrived in Germany for our summer vacation this year. We were mesmerized. What a splendid view, what a splendid landscape, what a splendid river, how good to be home. From the outset let me tell you we had a great time (only about 3 weeks), and despite our at best erratic planning and our lousy preparation, we were able to line up some unique, memorable and exquisite encounters with the wine and food world. I intend to write in more detail about most of these encounters. But let me not be too optimistic as regards the time available for blogging. So what were the highlights of our visit? Well, we had the best pork-knuckle ever (!) after a two hour march through the forests near the Ammersee on our way to the monastery of Andechs, a famous location for catholic pilgrims. Bavaria is a fantastic place to visit especially if the weather gods are smiling on you, and smile they did. We had warm, at times even hot, weather during the whole time of our holidays. Along the Mosel we visited three wineries – two along the Ruwer, one on the Sauer, both tributaries of the Mosel – and had one wine tasting in Trier city at Oechsle. Wonderful, exquisite, I can only rave about the many fresh and zesty wines we had the opportunity to sample. Another highlight was the visit of one of the best restaurants in the Alsace region of France. For a family lunch we went to the Auberge du Cheval Blanc in Lembach, Alsace near Wissembourg in the Vosges mountains. Needless to say we spent many afternoon and evenings in wine bars and beer gardens, among them the wine bar Kesselstatt and the wine bar “Weinsinnig”, two of my favourite places to relax and enjoy a good glass of wine in Trier. PS: I made some gorgeous pictures. You are currently browsing the The Man from Mosel River blog archives for August, 2013.